INTIMATE WATERFALL WEDDING: Be Married in front of our Waterfall: 30 minute reservation for Just the two of you or up to 6 family members / guests. The photographers guarantee to take at least twice as many included though they often take more. CAKE: 6 inch heart shaped cake for two. For our 30 minute wedding reservations: These would be our Just The Two Of Us ,Sneaking Out, Waterfall Wedding (for up to 6 guests) and Mountain Magic Wedding. Everyone, including the wedding couple, must arrived dressed and ready to meet the minister and the photographer when you arrive. These are more casual weddings without the traditions of our larger wedding packages. These weddings do not include music, a processional, escorts, a bridal party, flower girls/ ring bearers, family ceremonies, etc. For a more traditional wedding with music and other traditions, please consider our 1 hour wedding packages. 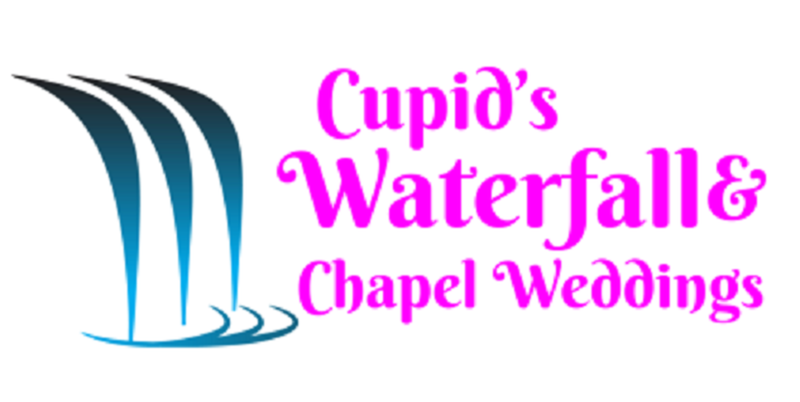 Waterfall Weddings: There are two man-made waterfalls on the grounds at Cupid's Waterfall and Chapel Weddings and we are proud to be able to offer them to our wedding couples. The smaller waterfall is located near the chapel and next to our signature white gazebo (another nice place to have a ceremony). These two areas (small waterfall and gazebo) can accommodate up to 6 family members/ guests for an intimate ceremony and are available 12 months a year for ceremonies as long as the temperature is above 45 degrees. The large two story waterfall is for more rustic ceremonies up to 20 guests with "U" shaped bench seating. There is no sound-system in this rustic area. For a more traditional wedding, please consider a OUTDOOR WEDDING CENTER Package. This waterfall is more susceptible to the freezing temperatures and needs to be treated (to protect the equipment) during the winter months and is not always available for winter ceremonies. Please keep that in mind if you are planning a winter wedding.